Political prisoner Sayd Mohamad Ebrahimi was summoned few days ago by the Magistrate in Evin prison and threatened with heavy sentence for disclosing details of torture he endured in the Intelligence Ministry’s Ward 209 in Evin prison. According to reports received by Kalameh, this political prisoner was interrogated and threatened by a Deputy of the Revolutionary Court, who is a cleric. This Judiciary official asked Mohamad Ebrahimi to deny the reports of his torture that was wildly reported by news sites, otherwise face heavy sentencing. Ebrahimi refused to deny he has been tortured. This Judiciary official threatened Ebrahimi that due to lack of his cooperation, a not so bright future awaits him and he will be in prison for many years to come. He also promised Ebrahimi that if he denies the torture accounts, he will be released very soon. Ebrahimi refused the offer. The main charge against this prisoner is his connection with Mothers of Laleh Park (The mourning mothers) and being the liaison between Mir Housein Mousavi and the Mothers of Laleh Park. The Mourning Mothers of Laleh Park are a group of mothers that have lost their children during the post-2009 presidential election events and/or their children have been arrested, are in prison or are missing. They demand the release of all prisoners of conscience and demand public trials of the perpetrators of killings and torture of their children. Few days ago, Mohamad Ebrahimi’s sister. in an interview with Jaras site, revealed details of her brother’s torture in Ward 209. This resulted in the new threats against her brother. In that interview, she said, “2 weeks after my father saw my brother in a psychiatric hospital in such dire condition, he passed away from deep sorrow. Before my father passed and after visiting my brother, he cried continuously and repeated “look at what they have done to my son” . Ebrahimi was incarcerated in solitary confinement in Ward 209 of Evin prison for the first seven months of his imprisonment before being moved to general Ward 350. Two months ago he once again was moved back to Ward 209 for further interrogation. After completing investigations and interrogations and being transferred to a general ward, they returned him to the high security Intelligence Ministry’s Ward 209, which is against the law. As of yet no verdict has been issued for Ebrahimi and he is incarcerated in Ward 350 in limbo status. His cellmates say he is in very bad physical and psychological condition. Jaras: Protesting lack of proper medical treatment in a hospital outside of Evin prison, imprisoned blogger Hossein Ronaghi Maleki is refusing medical treatment and his medication at Evin prison. According to Human Rights House of Iran (HARANA), Tehran Public Prosecutor had issued an order few weeks ago for Ronaghi Maleki to be transferred to a hospital outside of Evin for treatment, however, Ronaghi Maleki is still in Evin and not yet transferred to a hospital. Previously, Ronaghi Maleki, in a letter to the Public Prosecutor had requested to be transferred to a hospital, not shackled and handcuffed. He also had requested to be permitted medical furlough after receiving treatment in the hospital. Blogger Hossein Ronaghi Maleki has been in prison over 670 days. He suffers multitude of health problems including kidney malfunction, and despite this, his medical furlough has been denied by the Judicial and Intelligence officials. He was arrested on December 13, 2009 in the city of Makan close to Tabriz. He was immediately transferred to ward 2-A of Evin prison. He was in solitary confinement for ten months under severe physical and psychological torture for the purpose of obtaining false confession and giving an on camera false confession. He was tried and sentenced to 15 years in prison in Branch 26 of the Revolutionary Court. His sentence was upheld by the Appeals Court. He is currently in ward 350 despite dire health condition and urgent need for medical treatment. On Monday October 17, University of Tehran mechanical engineering student Amin Niyaifar, was lashed 30 times in Evin prison on the charge of insulting Mahmoud Ahmadinejad. According to reports received by Kalame, Niayifar, who is currently incarcerated in ward 350 of Evin prison, was returned to the ward after the lashing sentence was carried out, while he was in severe pain from the lashings he had received, but did not receive any medical treatment or help. While Niayifar is scheduled to be released next week at the end of completion of his sentence, he was summoned to be lashed during family visitation time at Evin prison. 22 years old Amin Niayifar, a supporter of the Green Movement, was arrested during the Ashura protests (December 27, 2009). He was tried and sentenced to six months in prison, a year and half suspended sentence plus 30 lashes. The sentence was issued by Judge PirAbbasi presiding over branch 26 of the Revolutionary Court. Niayifar with a distinguished academic record, had received a top-ranking score in the Iran National University Entrance Exam. His last year’s GPA was 19.20 (out of 20.00). A security agent, connected with the current government in Iran, is covering the people’s liberation movement in Syria as a reporter for the Iranian national TV/Radio broadcaster Seda-o-Sima. According to a number of post 2009 presidential election political prisoners, Hassan Shemshadi, who is currently working in Damascus as a reporter for Iran Central News Agency, was responsible for the production and recording of forced false confessions of the post-2009 presidential election political prisoners in Iran. According to number of Green movement political prisoners, Shemshadi was even present at the interrogation sessions when the interrogators at Evin ward 209 (under the control of the Intelligence Ministry) and Evin ward 2-A (under the control of IRGC) put pressure on the prisoners for the purpose of obtaining false confessions for broadcast. The presence of this regime’s security agent in Damascus, preparing biased reports of the liberation-seeking Syrian people, further points out the cooperation of the Iranian security forces with the Syrian security forces in cracking down on the popular liberation movement of the Syrian people. In one of his latest reports, Hassan Shemshadi reported on the case of a female who was said to have been killed in Damascus. The Syrian national TV broadcast a program showing this girl, alive as evidence of the opposition movement’s lies and fabricated stories. This story has an eerie similarity to the case of Saeideh Pouraghaei as well as the coverage that the Iranian national TV gave to the case of Taraneh Mousavi a few months after the 2009 presidential election. It appears that the people who designed this form of coverage both in Syria and in Iran are working very closely together. According to sources in Rejaei Shahr prison, political prisoner, journalist Isa Saharkhiz has launched a hunger strike as of Thursday October 6. He has also threatened to stop taking all his needed medication. According to reports received by Jaras, Isa Saharkhiz’s physical health has regressed during the past 2 years that he has been incarcerated. This journalist imprisoned at Rejaei Shahr prison,in addition to highly irregular blood pressure, suffers from severe back pain. He has three damaged vertebrae in his spinal cord that were damaged during his incarceration. According to a physician, if left untreated, it can lead to paralysis. Considering the fact that political prisoners are allowed to be treated in a hospital outside of prison only with the approval of the Public Prosecutor, and the fact that it takes the Prosecutor months to issue such approvals, Isa Saharkhiz with four damaged vertebrae in his lower back and two damaged vertebrae in his neck, will soon have to use a wheelchair. According to reports received by Jaras, doctors have discovered Saharkhiz has a cancerous tumor that is suspected to be cancerous and needs to be treated immediately. Isa Saharkhiz, is a member of the Central Council for the Association of the Defense of Press Freedom and is editor-in-chief of the banned newspaper “The world of Economics” and the monthly publication “Aftab”. He was head of the press department at the Iranian Ministry of Culture and Education during former President Khatami’s Reformist Administration. Saharkhiz was arrested June 2009 during the post-presidential election of 2009 mass arrests. He was tried in Branch 15 of the Revolutionary Court presided by Judge Salavati and was sentenced to three years in prison on charges of insulting the Supreme Leader and propaganda against the regime. During his two years and three months detention, despite recommendations by prison physicians, he has not been allowed medical treatment outside of prison and also has not been permitted the use of furlough. The report that was received by Jaras on Saharkhiz’s hunger strike also indicated that among the political prisoners there is an elderly 83 year old man in dire condition, suffering from leukemia. He might lose his life if proper care is not provided, just like political prisoner Mohsen Dokmechi, who lost his life due to lack of medical treatment for his cancer. Also, several reports indicate a worsening of sanitary situation in Gohardasht prison, and added pressure on the political prisoners and their families has been reported. Payman Aref believes that the flogging sentence, and also the implementation of it, was illegal. Prior to his release, Payman Aref received 74 lashes as part of the sentence. Although he was not in good physical condition after the lashings, he agreed to give an interview to Jaras site. Mr. Aref, this flogging sentence was not carried out symbolically as these days they say they perform, right? Not only they did not perform this flogging sentence symbolically. But I wish they would have at least followed their own ruling, meaning they should have performed the Taaizi flogging according to Article 609 of the Islamic Republic penal code (Note: according to the penal code a Taaizi sentence can be converted in lieu of fines, and if flogging is performed, it should not be harsh and hard). Renowned religious scholars insist on the difference between Taaizi flogging and Haadi flogging (Note: According to the penal code, Haadi flogging is given for more serious crimes like adultery or consumption of alcohol and should be performed in harshest manner). In the Taaizi flogging sentence, the person performing the flogging should not raise his arms up very high, should hold a Qoran under his arms so he can not raise his arms high enough for the book to fall, but they performed the flogging in the most savage and brutal way. They flogged me in the same manner that is allowed in Sharia Law for adultery and consumption of alcohol. For exactly what crimes was the sentence of flogging performed on you? For insulting Ahmadinejad, as per Article 609 of the Islamic Republic penal code. Judge Pirabasi issued the 74 lashes sentence in Branch 15 of the Revolutionary Court. In the Prosecution’s office in Evin, witnessed by Mr. Dehnamaki, the Office Manager for Public Prosecutor’s Deputy. The sentence was carried out in the most brutal manner. My Taaizi flogging sentence was performed in a Haadi flogging manner. I asked them for a Judicial order. Right then and there I made a complaint to Mr. Jafari-dowlatabadi (Tehran Public Prosecutor). Right here, I ask Mr. Jafari-Dowlatabadi to issue a judicial order; that is if he really is the Public Prosecutor, which I doubt he is. Was your wife present at the time of execution of this sentence? My prison term was finished today. Since I was to be released today, they took me to the Magistrate’s office in Evin prison. The assistant Prosecutor is Mr. Khodabakhsh, who was not present in the office. They did allow my wife to be present in the office. A masked person came into the room, and the person who flogged me also had a mask on his face. They took me to another room at the end of the hallway, and, in the presence of Namaki, the assistant Prosecutor, they flogged me. The person flogging me raised his arm up as high as he could and hit me in the most brutal and harsh way that he could. After being flogged, what did you feel? I could not hold my back straight from the pain of being flogged and my heart condition is not good. On the advice of the doctors I took a shower but the pain and burning sensation is severe. Every time that Ahmadinejad is in New York, he claims that we have the most free country in the world. However, right here in my own country, they flogged me in the most brutal manner for the crime of insulting him. I only wrote a letter to Ahmadinejad explaining the situation in our universities. My letter still exists, I did not insult Ahmadinejad in that letter at all, I only said I will never say hello to him again. I want to emphasize that the verdict given to me was illegal and the flogging sentence was performed in the most brutal manner. Three weeks after arrest of Kamran Rahimian and his wife Faran Hesami of Baha’i faith they continue to be detained in Evin Prison. Eight Bahai’s in Mashhad were sentenced to 15 years in prison collectively and 20 Baha’is were arrested in Esfehan last week. Kamran Rahimian and his wife Faran Hesami were arrested on September 13 along with Kayvan Rahimian and Shakib Nasrollah, all Psychology Department faculty members of the Baha’i online university. Kayvan Rahimian and Shakib Nasrollah were released on bail on September 21 but Rahimian and his wife continue to be detained. Also they both have been fired from their psychology consultant jobs in NGOs. These firings occurred after threats were made by Intelligence Ministry agents. Also, Mashhad Revolutionary Court has sentenced eight Baha’is residing in Mashhad to fifteen years in prison collectively. Mashhad’s Revolutionary Court has sentenced Bahman Yazdani, Vesal Mohamadi, Shahab Taefi and Afshin Nikaaein to 2-3 years in prison. Nahid Ghadiri, Rosita Vaseghi and Nora Nabizadeh have been sentenced to five years in prison each. Nahid Ghadiri, Rosita Vaseghi are currently detained in Mashhad prison. According to Human Rights news agencies, 20 people of Baha’i faith, including a 9 year old were arrested in Esfahan on Thursday September 29, 2011. According to the Committee of Human Rights Reporters, on Thursday September 29, 2011, Farid Eshtiyagh, Parisa Rahmani, Farzad Rohani, Rohiyeh Hakimian, Samira Ghane, Arman Rahimi, Heshmatollah Niki, Shahla Sanaei, Fazel Behnam, Ferdown Niki, Saha Behnam, Soheila Davardan, Dariyoush Dashtpich, Laleh Namjouyan, Attaollah Daneshgar, Lava Daneshgar, Anisa Daneshgar, Darab Yazdani, Sohaila Vahedian, Tajolmolok Janamian and Dina Safapour (9 years old) were all arrested. Eight of the twenty arrested, including the nine year old were released later. According to this same report, after the arrest of these people, homes of Parisa Rahmani, Farzad Rohani and Attaollah Daneshgar were searched and number of items were confiscated from their homes. This same Human Rights agency also reports that trials of seven Bahai’s connected with the Baha’i online university were held at Branch 28 of the Revolutionary Court presided by Judge Moghayeseh. According to this report, within the last few weeks, Vahid Mahmoudi, Ramin Zibaei, Kamran Mortezaei, Farhad Sedghi, Noushin Khadem, Mahmoud Badavam and Riyaz Sobhani were all tried at Branch 28 of the Revolutionary Court. All were charged with membership in the anti-national security Baha’i organization (Article 499). It should be noted that the trial of some these people only lasted for few minutes. Six of these people were arrested in raids of their homes on May 22nd. Riyaz Sobhani was arrested on June 15, 2011. 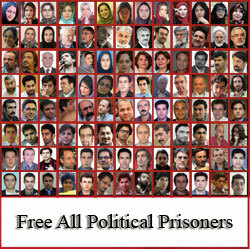 They are all currently held in ward 209 of Evin prison in shared cells. From May 22, 2011 there has been added pressure on Baha’i online university. During this period, more than 20 people connected with this university have been arrested and more than 50 officials, faculty members and students have been summoned by Intelligence Ministry and pressured to sign a pledge not to cooperate with the university. Also during this period, several locations associated with the University have been locked and sealed by the authorities and the university’s site has been filtered several times.